“Columbus” is a quietly stirring, exquisitely photographed romantic dramedy with a strong ensemble, led by John Cho. Rating: 4 stars out of 4. 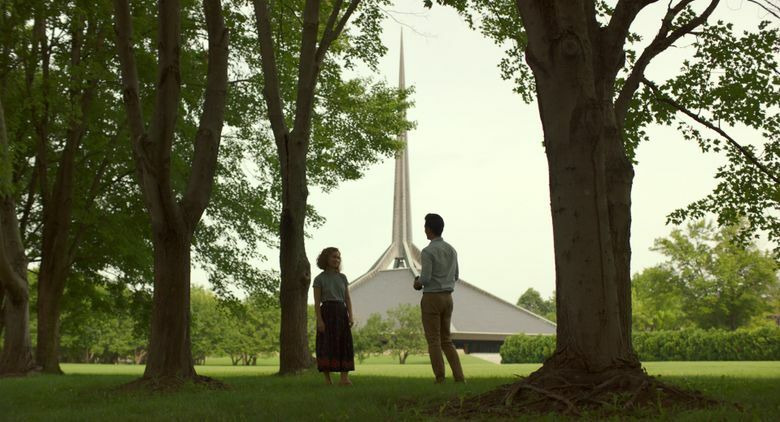 The quietly stirring, exquisitely photographed “Columbus” is an art-house gem that beautifully illuminates not only the architecture of a small Indiana town, but also the characters that inhabit it. This is a film with a wavelength all of its own, but thanks to excellent directing and acting, that wavelength always remains accessible. The plot is simple: A book translator named Jin (John Cho) finds himself stranded in Columbus, Ind., after his distant father, a renowned architect, is hospitalized in a coma. Outside his hotel, Jin meets architectural enthusiast Casey (Haley Lu Richardson), and they begin talking about buildings — and eventually much more. The architectural discussions could have become boringly esoteric, but Cho and Richardson keep things interesting and make the dialogue crackle, creating low-key but deceptively high-impact encounters that change both of their characters. Their scene on a covered bridge, in which Jin and Casey call each other out, is spectacular. ‘Columbus,’ with John Cho, Haley Lu Richardson, Parker Posey, Michelle Forbes, Rory Culkin. Written and directed by Kogonada. 100 minutes. Not rated; for mature audiences. SIFF Cinema Uptown. It borders on the criminal that the handsome, versatile Cho has so far not become a Hollywood leading man, but “Columbus’” proves that he is more than up to the task. Richardson, for her part, is a star waiting to happen: She dazzles in every scene. A strong ensemble — including Rory Culkin, Michelle Forbes and Parker Posey — makes the film even more layered. Writer-director-editor Kogonada also has a great character in the town of Columbus, and it’s fascinating to watch how he frames his actors within the confines of their architectural surroundings. But what makes his film stand out is that he imbues it with a surprising sense of humanity. As quiet as the proceedings are, we end up being quite moved.